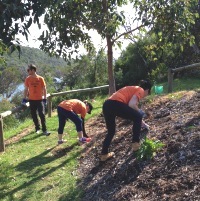 The annual weekend visit to Margaret River by Curtin Volunteers took place recently. The students spend time during the weekend working on community projects in the area. They are hosted by members of club and the visit includes a social. 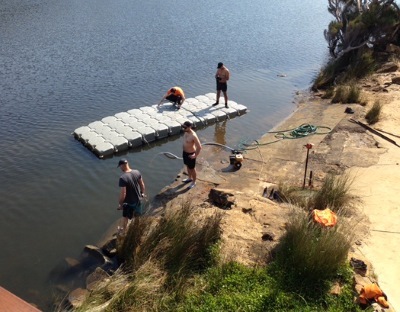 This year the students helped relocate a landing stage before clearing the banks of weeds at the Rowing Club. After lunch they then moved onto the Old Settlement for the afternoon helping with general maintenance. The CV's enjoyed a vocational visit to the Wallcliffe Volunteer Fire Brigade headquarters where Gordon and Barney bought them up to speed with the latest equipment. A BBQ and fellowship was enjoyed by all, a great chance to mingle as most of these participants are also members of the newly formed Elizabeth Quay's Rotary Club. 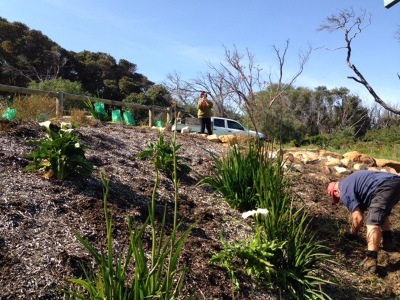 Sunday saw them reconvene for a bit of weed eradication along the banks of the Margaret River from Rotary Park and a competition evolved which did well to spur on the process. Lunch was kindly provided again by Fran, Sue, Ley, Pat and Marg.